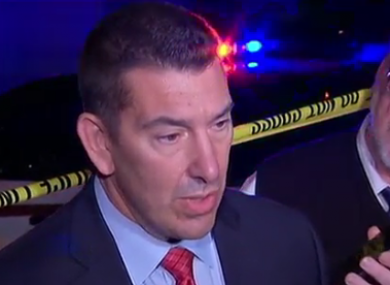 A police spokesman speaks to reporters in the aftermath of the shooting. A SHOOTING AT a backyard party in the town of Wilkinsburg in the US state of Pennsylvania has left five people dead, and at least two suspects are on the loose, police have confirmed. Four of the victims – three women and one man – died at the scene while another woman died in hospital, Allegheny County police said in a statement. Two men are in critical condition and a woman is in stable condition following the incident at a home, they said. “The ballistic evidence on the scene leads police to believe that two different weapons were discharged from two different people,” the statement said. Police said shots were fired from an alley and that when partygoers tried to seek cover in the home, someone on the side or backyard adjacent to the residence fired at the back porch. All four victims who perished at the scene died on the back porch. Neighbourhood resident Kayla Alexander told local broadcaster WPXI that the street where the shooting occurred is normally quiet and filled with playing children. The mass shooting is the latest to rock the United States, where such attacks have become commonplace. Gun violence is responsible for some 30,000 deaths per year in the country, with 330 mass shooting incidents recorded last year. Read: Minority governments and grand coalitions – what do these things mean in practice? Email “Five killed in US shooting, two suspects still on the loose”. Feedback on “Five killed in US shooting, two suspects still on the loose”.